Is there a way to lock members from editing their first name, last name, and email address at any point after they register? Thanks for getting back to me! It looks like this option is for redirecting people away from the default profile panel (that looks like it's on the back end). Is this the setting you were referring to? Ideally I'm looking to have people unable to edit any part of their profile or be able to access that back end profile screen. Maybe you can lock all "*/wp-admin/*" URLs, by .htaccess as example, or redirect them to home page? Yes. 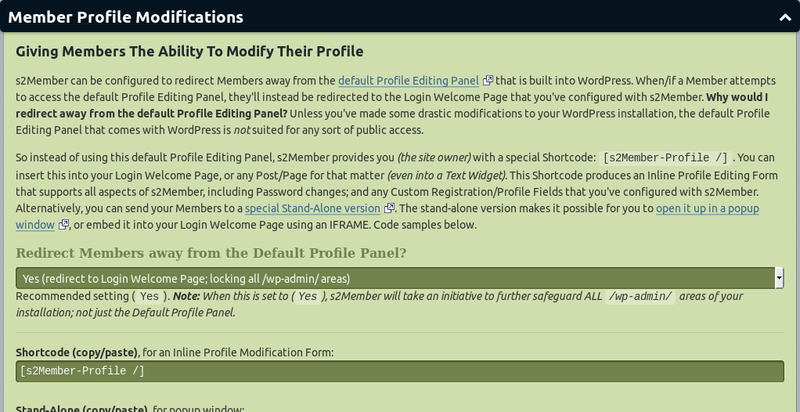 If you use this, they won't have access to the profile editor in WordPress' admin area, and if you don't provide one on the front end, they won't have where to edit their profile from.